Atlas Travel, LLC. will ensure the lowest fare available for your travel itinerary. - Once a reservation is confirmed the ticket must be issued to guarantee the quoted fare. - Changes in a reservation or routing may result in the purchase of a new ticket at a different fare. - Coupons or special promotional discounts must be provided at the time of booking. 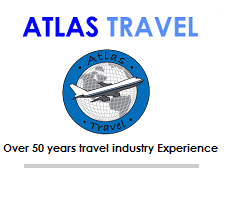 Atlas Travel offers a Computerized Rate Program that offers negotiated rates at many hotels worldwide. Atlas Travel will negotiate lower corporate rates for cars, hotels, airport parking and group airfare based on your travel volume.